David Bowie ‎– Original Soundtrack Zum Film "Christiane F. - Wir Kinder Vom Bahnhof Zoo"
Master release including official soundtrack-only release versions. Has anyone seen this yet? My Los Angeles store (Amoeba) never got any copies. what about sound quality and overall impression, as good as previous coloured compilations? If you're a Bowie lover this album will definitely not disappoint. Your collection is not complete without it! 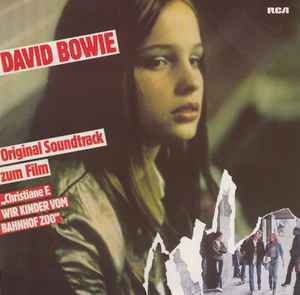 Although the entire soundtrack (save for "TVC 15" and "Stay") is made up of songs from Bowie's Berlin years (1977–1979), the story of Christiane F. plays before that time; e.g. Christiane F. visited the concert of the Isolar - 1976 Tour in Berlin, which was opened by the song "Station to Station". The live version included in the film and soundtrack is taken from the album Stage, recorded on the 1978 Isolar II Tour. The German title of the film, Wir Kinder Vom Bahnhof Zoo, means "We children of Zoo Station", referring to the railway station in Berlin, Germany. West German for UK Market. prime slice of Euro-Bowie 76-79! Worth every cent of the purchase price just for "Heroes/Helden"
Right Society [Sticker]: "Importé d'Allemagne par RCA__Contrat BIEM / IFPI N° 044"
Promote Yellow Sticker [Front Cover]: "Bande Originale Du Film__Moi, Christiane F."